The current Pali Highway is actually the third roadway to be built here. The original Pali "highway" went along much of the same route and portions of the old road still exist, although closed to vehicular traffic. 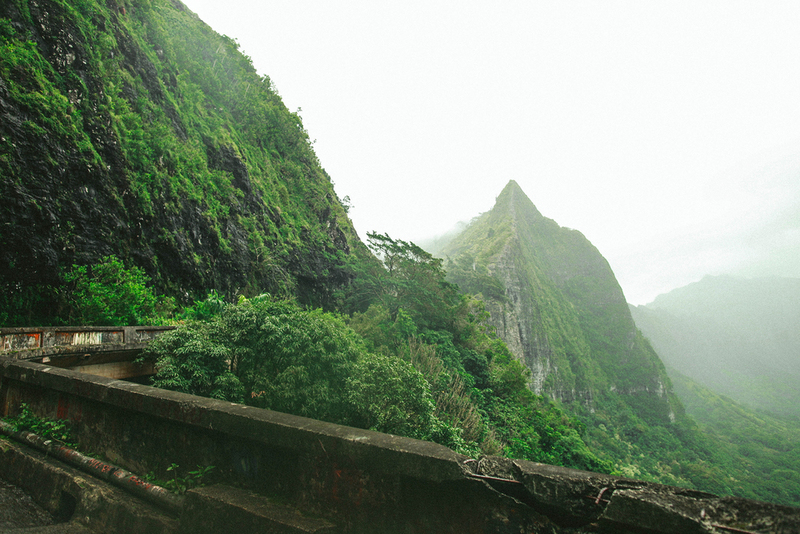 When the current Pali Highway and its tunnels opened, the original roadway was closed and is now used by hikers. The "Old Pali Highway", as it is now called, is noted in the popular culture of Hawaii for being a place with strong spiritual connections. Many ghost stories have settings along this old highway. A large portion of the old highway was built over the ancient Hawaiian foot paths that traversed the famous Pali pass, which was the most easily accessible route to take from the Windward to Honolulu side. This was because much of the Koʻolau range on the Windward side has steep cliffs that make it nearly impossible to traverse over safely. It is said there is a moʻo wahine (lizard woman) who lingers around the pass. A moʻo wahine is mythical creature who takes the form of a beautiful woman and leads male travelers to their deaths off the cliff. She is similar to a western poltergeist or mermaid. Hawaiian folklore holds that one should never carry pork over Nuʻuanu Pali, especially at night. Motorists reported that their cars mysteriously stopped and would not start until the pork was removed from the car. Pele (a more powerful and influential goddess than the moʻo wahine) was said to be responsible for this to prevent the passage of pork over the Pali. It was said Pele, the volcano goddess, was responsible for preventing passage due to her contest with Kamapua'a, a half human, half hog god, and would not allow him (in the form of pork) to trespass on her side of the island. Finding this small hike was by total mistake. We had only planned to hit the Old Pali Road only to reach the top of the Pali Lookout. When we were up there, we saw a small path that was tucked away on the side of the mountain with a bright orange striped sign, usually meaning to stay out or be cautious, but those signs for me mean "Welcome." So of course, we went around the sign and found our selves on what used to be the Pali Highway, also known as the Hawaii Route 61. It was surreal to walk on this abandoned highway just knowing that it used to be used by cars. It was super narrow and tons of sharp turns and bends, no wonder they put it out of commission. Although it was raining on and off during this short walk, it was more definitely worth it. I was running around ducking and hiding under dry spots trying to keep my cameras from frying.